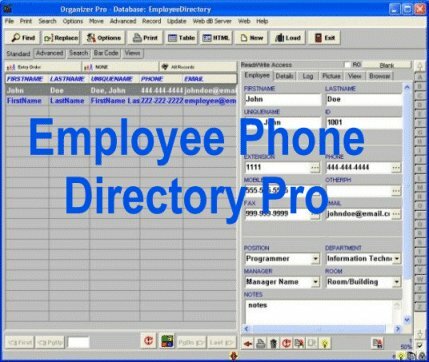 Employee Phone Directory Pro for Windows: database management software that helps you to organize and manage your company employee phone directories. Databases included: Employees : manage your employee phone directory.Log : track all out-of-office hours and days.Events : manage employee events. Contacts : organize all company important and emergency contacts. Save time organizing your records. Learn once use multiple times. * Simple, easy-to-use: Ready-to-use database templates and the user-friendly interface let you easily and quickly organize your employee phone directory data. * Quickly access your data: You can access and view your employee directory data in virtually any way. Table Viewer allows you to view data in rows and columns. Browser Viewer allows you to view data in virtually any way using browser viewer. Standard Record Viewers allows you to easily enter, and modify staff data, or quickly generate data specific commands. * Easily process data: Report Wizard, Label Wizard, HTML Generator Wizard let you create employee directories, phone lists, email lists, employee reports, summaries, Web pages , labels with color and graphics. Qweas is providing links to Employee Phone Directory Pro 2.7 as a courtesy, and makes no representations regarding Employee Phone Directory Pro or any other applications or any information related thereto. Any questions, complaints or claims regarding this application Employee Phone Directory Pro 2.7 must be directed to the appropriate software vendor. You may click the publisher link of Employee Phone Directory Pro on the top of this page to get more details about the vendor.